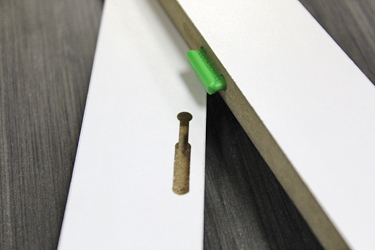 Lockdowel's new Mini Barbed Channel Lock is a simple solution to fastening half-inch and thinner boards. It resists at least 70 lbs. of pull force and is ideal for drawer boxes and cabinets. Assembly is 60% faster than glue, dowels and screws., and once assembled the hardware is completely invisible. In testing, the device significantly outperformed dovetail boxes in strength. The device comes in nylon and metal and has a sheer force of 50+ lbs. Once inserted, it can be disassembled for reassembly. It will be on display in Booth 8073 at the International Woodworking Fair (IWF 2018). Brown Wood, Inc. is headquartered in Lincolnwood, Illinois and also operates from locations in Maine and Ohio. 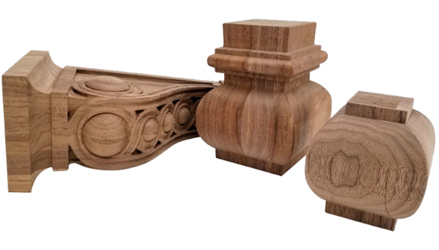 The company supplies wooden columns, corbels, brackets, bun feet, carved appliques, moldings and a host of other products designed to let woodworkers add an air of distinction to projects. In fact, that's the name of the catalog, and Designs of Distinction has just updated its 2018 price sheet to include the new Modern Farmhouse Collection. Existing customers will be pleased to hear that the updated online version now includes a linked table of contents, and products organized by category. They'll also find lower pricing on some walnut products, and new products such as shelving, hood wrap, x-panels and shiplap. Those of us who remember the thrill of using an Onsrud inverted router about forty years ago are not surprised to see how far the company has come. Back then, it was state-of-the-art technology. 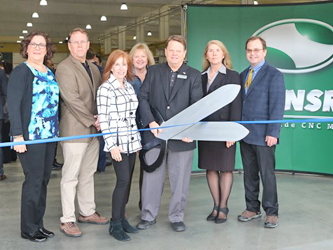 Now the Trautman, North Carolina manufacturer of CNCs has opened a new 55,000 square foot fabrication center, which it calls 'Building 2' (that was the ribbon cutting ceremony in March, at left). The original Building 1 has also been remodeled and refitted with new milling machines. While C.R. Onsrud grew out of the Carolina furniture building tradition, today it serves a wide range of industries that make specialty parts, including woodworking, plastics, aerospace and automotive. Despite so much success and its evolution into a high tech industry leader, this is still a family run business. Charlie Onsrud started the business in the 1970s, and today his sons Tom, Bill and John are at the helm. Running Plastics On Your CNC? 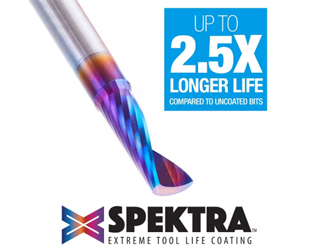 On May 10th, Amana Tool announced the exansion of its line of Spektra™ Extreme Tool Life coated solid carbide spiral ‘O’ flute CNC bits for plastics. There's a full line for wood and wood products, too. The Farmingdale, New York manufacturer says these bits feature a nACo® nanocomposite coating with an extreme Nano hardness and heat resistance. With a brilliant distinctively-tinted coloring, nACo provides additional improvements in several critical aspects of router tooling. It enables the tool's cutting edge to retain crucial sharpness and lubricity. It provides longevity and produces cutting results of the highest quality. And it prevents high heat and oxidation, which are detrimental to cutting tool performance. The multi-colored hues, while attractive, will dissipate upon use but the coating will remain fully effective. nACo offers a hardness rating of approximately 4,500 Vickers , which is 2.5 times that of uncoated bits. This group of tools is designed for use on acrylic materials (Plexiglas® Lucite®) other plastics, and is available in a variety of sizes. 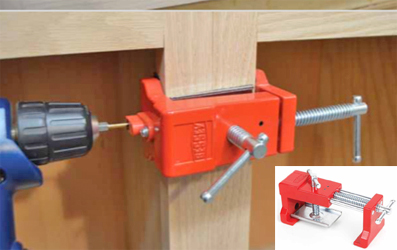 Bessey Tool has introduced a clamp just for woodworkers who install face frame cabinets. The new BES8511 Cabinetry Clamp is designed to combine the multiple steps of face frame cabinet installation into one easy process. It works on stiles up to 1-1/4" thick, and 4" wide combined. The stiles can be tightened, aligned, pre-drilled and fastened while the clamp is in place. It holds the individual cabinet edges together while also keeping the faces flush along the joint. There's an integrated pilot-hole drilling guide on one end. This guide slips out of the way so you can drive screws without removing or repositioning the clamp. It's a heavy-duty steel clamp with steel sliding T-bars, an aluminum alignment plate and non-marring felt pads. Click on the picture. 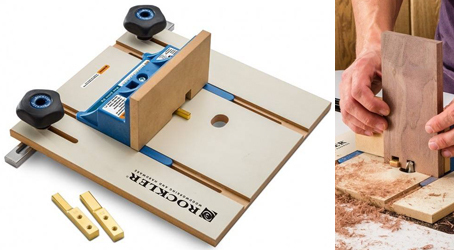 Rockler Woodworking and Hardware has updated its Router Table Box Joint Jig. It now features a backer sled that’s been redesigned to provide smoother motion and more control. It has three interchangeable brass indexing keys for 1/4", 3/8" and 1/2" box joints. Each key mounts to the sled with machine screws so swapping sizes is easy, and there are storage slots on the sled for the keys that are not being used. The new sled body is larger, with spots for clamping, and it’s made from reinforced nylon. A replaceable MDF sacrificial fence for mounting to the backer sled is included. Expandable miter bars secure the jig in router tables with a standard 3/4" x 3/8" miter slot. $79.99. 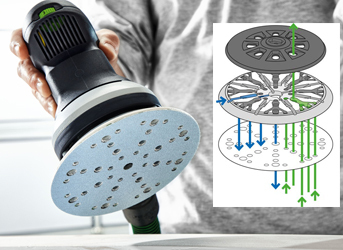 Festool USA and Festool Canada just introduced a new sanding technology called Multi-Jetstream 2. It's composed of two elemennts - pads and abrasives. The system is a unique interaction between intake and exhaust air, providing close to 100 percent dust extraction. It also means longer abrasive life, and dust removal from the very edge of the pad. It's available in a variety of 150mm (6") pads, from ultra-soft to hard, and the grit range is from P40 to P1800. A patented channel structure means that the abrasive remains virtually dust-free for a longer period of time. The fastener is resistant to high-temperature, so the service life of the sanding pad is significantly extended. The fastener is made from an extremely durable material with special hooks that ensure perfect adhesion of the abrasive. And that optimized intake and exhaust air system increases suction power for clean and healthy working. Tape measures aren't usually that exciting (well, until you get to the jobsite and find you forgot it). They need to be reliable, tough, easy to read, and accurate. 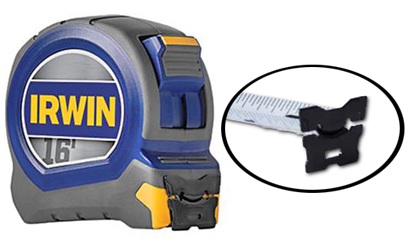 Huntersville, North Carolina based Irwin Tools has released a new 16-foot Pro tape measure that meets all those criteria. It has a nylon-encased blade, so it's tough enough for years of jobsite use. It has a high contrast, dual-sided white blade that makes it easy to read. There's a decent belt clip. And for measuring openings, it will stand out a full nine and a half feet. But what's really news here is an innovative, four-sided hook that means there's a whole lot less bad language on the jobsite: it will grip and hold long enough to take a measurement. The hook also has four rivets, so it won't be going anywhere on its own. Woodshops looking at updating their dust collection often consider adding automatic blast gates to improve the efficiency of the system. But gates can do a lot more. Dust extraction is a very large part of the electric bill, and Ecogate has uploaded a new movie on YouTube that explains the savings and other efficiencies in less than two minutes. For example, the company's VFD control will adjust the collector's fan speed so that the system isn't running full out when there's only a single machine creating waste. A sensor is attached to each workstation, and it reports in real time to a greenBOX control unit. Ecogate has also prepared a new overview of industrial dust collection, specifically for the woodworking industry. 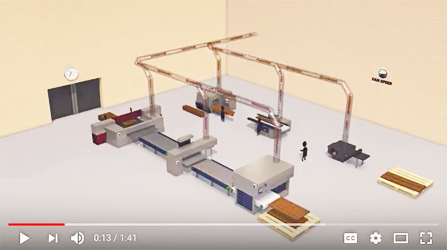 Two recent software releases from MecSoft Corporation might be of interest to woodworkers running CNCs. The first, RhinoCAM 2018 for Rhino 6.0, came out in late February. 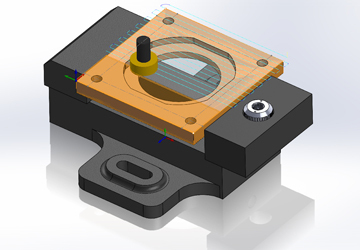 Then the company announced the availability of VisualCAM 2018 for SOLIDWORKS in April. Users have the option now to choose RhinoCAM 2018 to either run inside Rhinoceros 5, or in the newly released Rhinoceros 6. And the new VisualCAM version includes the ability to run inside the Assembly document of SOLIDWORKS (see photo). Joe Anand, president and CEO of MecSoft , noted "that opens up significant productivity improvements for users. This is in addition to innovations such as the addition of new toolpath methods and enhancements to existing methods. MecSoft continues to deliver functionality only found only in products costing thousands of dollars more." 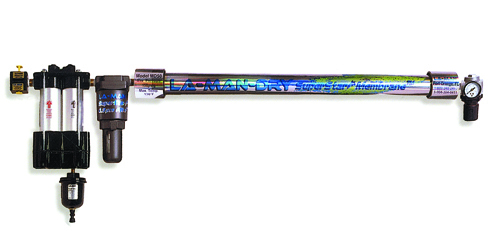 Minnesota based LA-MAN Corporation's dryer lowers the dew point in a woodshop's compressed air supply by continuously removing water vapor and venting it into the surrounding atmosphere. With dewpoint temps available as low as -40F and a wide range of flow capabilities and pressure ratings, the dryer is ideal for clean rooms, paint spraying, material finishing and powder coating. It has a pre-filtration system with a high efficiency coalescing filter, ensuring contaminant and particle free air for optimal performance. An optional automatic float drain allows the discharge of moisture while preventing any system air loss. Maintenance on the unit is easy, without removing it. 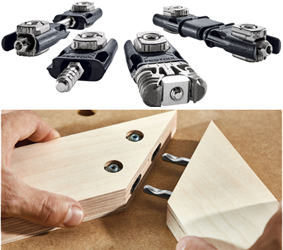 Festool recently launched a new generation of connectors for the DF 500 DOMINO Joiner. They are intended for building knock-down furniture and casework that can be assembled using only a hex wrench. Connectors for the XL DF 700 were introduced in 2017, and this new line is for the DF 500. 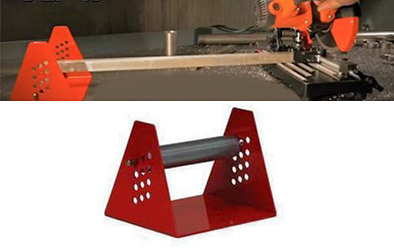 They can be used to create flat or corner joints without the need for templates or complex measuring. There are colored cover caps, and the connectors are available as a set or as individual components. 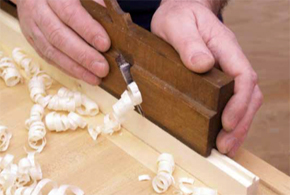 Based on the mortise-and-tenon principle, joints made with the DOMINO joiner benefit from the design of the oblong mortise and mating tenon, and the knockdown metal fastener is robust with high connection strength. They can be used to connect frames, panels, tops, and other joints and pieces, and easily disconnect and reconstruct as needed. Woodworkers can use this knockdown technology to move their custom large furniture or casework units from the shop to the jobsite, as they can be separated into parts and reassembled quickly on site. Framing and finish carpenters might be interested in a lightweight little device from Sawblade.com that's called the RS 500 portable roller stand. It's an outfeed support that can be adjusted to hold stock parallel with the bed on a miter saw, and it only weighs one pound. The wide bed offers a lot more stability than site-made supports made from framing cut-offs. Woodworkers using a couple of these can set the saw on a bench or on the floor, and the adjustable roller will hold long pieces straight so they can be mitered or cross cut more accurately. The stand, manufactured in the U.S., accommodates boards up to about 5-3/4" wide, and the roller will adjust from 2" to 4.75" in ¼" increments. The RS 500 is made with powder coated steel with a steel-polished roller, and it's currently (May 2018) on sale for $48.57 at sawblade.com. Michigan based Trotec Laser will be holding a series of laser workshops throughout the southeastern United States during 2018, in areas such as Nashville, Raleigh, Miami, Dade City, and Gulf Port. The workshops are designed to provide education on laser technology and promote an understanding of how lasers can add value to a business. Agenda items will vary from location to location, but topics will include laser skills such as how to use a rotary attachment, how to use JobControl Vision, and other tips and tricks and laser best practices. 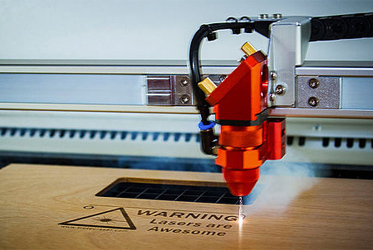 Workshop topics will include an overview of different types of laser machines, how they work, and how to choose the right laser engraving, laser cutting or laser marking system for an application. The workshops also provide practical laser training on how to use various laser capabilties to add value to a business. Next Wave Automation has been celebrating the tenth anniversary of the introduction of its CNC Shark. 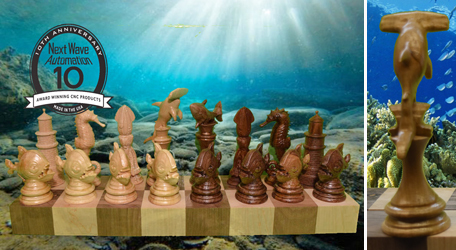 That took the form of providing customers and visitors to its website with free instructions and VCarve files to make a complete ocean-themed chess set. The final piece, the hammerhead shark king, is now available at no charge on the company website. The other projects are the chess board, lighthouse rook, piranha pawn, seahorse knight, squid bishop and a shark queen. Tim Owens, founder and CEO, explained that he wanted to thank CNC Shark users while providing them with a fun way to explore all the intricate and beautiful things that their machines can do. The commemorative chess set can be made using any of the company’s CNC models, by taking advantage of the double-sided machining available in Vectric’s New V9 Software.